Two species of lionfish (Pterois volitans and Pterois miles) are the first marine fishes known to invade and establish self-sustaining populations along the eastern seaboard of the United States. First documented off the coast of Florida in 1985, lionfish are now found along the Atlantic coast of the United States as well as in the Caribbean Sea and Gulf of Mexico. Although long-term effects of this invasion are not yet fully known, there is early evidence that lionfish are negatively impacting native marine life. The lionfish invasion raises questions about which types of habitat the species will occupy in its newly invaded ecosystem. In their native range, lionfish are found primarily on coral reefs but sometimes are found in other habitats such as seagrasses and mangroves. 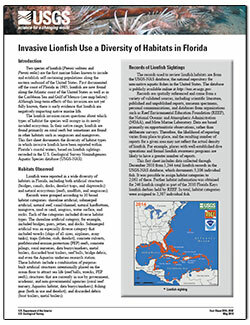 This fact sheet documents the diversity of habitat types in which invasive lionfish have been reported within Florida’s coastal waters, based on lionfish sightings recorded in the U.S. Geological Survey Nonindigenous Aquatic Species database (USGS-NAS). Schofield, P.J., Akins, Lad, Gregoire-Lucente, D.R., and Pawlitz, R.J., 2014, Invasive lionfish use a diversity of habitats in Florida: U.S. Geological Survey Fact Sheet 2014–3032, 2 p., https://dx.doi.org/10.3133/fs20143032.